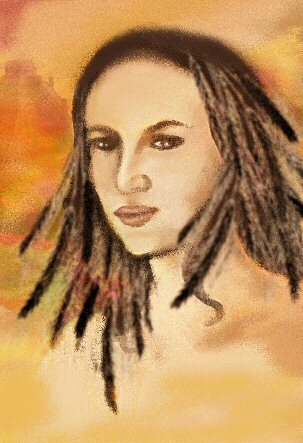 is a Sumerian grain Goddess. "The growing grain, the life of Sumer", "the good bread of the whole world". He sister Lakhar is the sheep goddess. She is also the supporter of treaties and laws by withholding abundance from anyone breaking them. Now when the harvest season for grain gets closer and we are about to celebrate the first harvest, let's look a bit closer at cereals. * "old world grains", that used to be called "corn" (Goddess of corn isn't necessarily the same thing as Goddess of Maize), especially barley, but also wheat and rye, sometimes even oat. #1, #2 and #3 - Wheat, corn and rice are the most used grains in the whole world. It varies which one is on top, they are all VERY popular. #4 is barley, thanks to beer and other alcoholic beverages. Barley is also used as animal food, because it is very easy to grow and very tolerant; it doesn't much care about lack of water, cold or heat.#5 and #6 are sorghum and millet. Many believe them to be the same, but they are not. Millet is one of the oldest grains in the world, and it sustains 1/3 of world population. # 8 is rye, which is very important in Northern Europe. We Finns couldn't live without our rye bread, and as far as I know the Danes and Russians have the same relation to theirs :-D Rye is nutritionally very important. Bread that is made of rye, even refined rye, keeps the eater satisfied longer than wholemeal wheat. 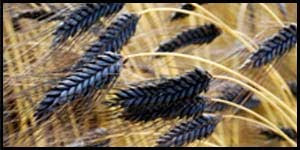 # 9 is Triticale - hybrid of wheat and rye, with similar qualities as rye. # 11 is teff, another African, mainly Ethiopian grain. Teff is amazing nutritionally and could easily grow everywhere in the world. # 12 is buckqheat, which is not really a cereal. * chia isn't really a grain, it's seeds of a American salvia. It's nevertheless very nutritious, oily and very good food. * flax seeds are another non-grain food that can be used as grain. Place the flour, baking powder, and salt in a large bowl; mix well. Make a well in the center and add the oil, ice water, and eggs. Mix with a spoon, incorporating the wet and dry ingredients to make a smooth dough. Turn out onto a board and knead for 2 minutes. Place the dough in a bowl, cover with a damp towel and let stand at room temp. for 30 minutes. On a lightly floured surface, divide the dough into 4 balls. Slightly flatten each ball to make a disc shape. Divide each disc into 4 equal balls. Cover with a damp towel and let sit at room temp. for 10 to 15 minutes. Roll each ball out into a circle about 3 1/2 inches in diam. Cover the dough circles with a damp towel until ready to fill. In a bowl combine 1 beaten egg and the kasha, stirring to coat each grain with the egg. Heat a large non-stick saute pan over high heat. When the pan is hot, add the grain and cook, stirring constantly, over moderate heat for 4 to 5 minutes, or until the kasha kernels are separate and smell nutty. Add the chicken broth and bring to a boil. Reduce the heat and cook, covered, for about 20-25 min. or until liquid has evaporated and the grains are tender but chewy. Cool at room temp. Meanwhile, saute the onion in the chicken fat over high heat for 15 minutes, stirring frequently, until soft. Add to the kasha and season with salt and pepper. Add the 3 eggs and mix well. Place 2 rounded T. filling in center of each circle. Pull the edges up around filling, completely enclosing it and pinching the dough to form a tight package. Turn the packages over, place seam side down on a lightly greased baking sheet, and brush the surface with an egg wash (1 egg beaten with 1 T. water). Bake for 25 to 30 minutes, or until light golden brown. Serve hot. Saute onions in oil in a large skillet until lightly browned. Add mushrooms & cook until mushrooms are lightly browned. Set aside. Place egg substitute in a bowl & toss the kasha in it. Place tossed kasha in a large skillet with a tightly fitting cover. Over high heat, flatten, stir & chop the kasha with a fork until the grains separate. Remove from heat. Bring broth to a boil. Slowly pour broth over the kasha, cover skillet, & cook over low heat until the liquid is all absorbed, about 10 minutes. Remove from heat. Mix 8 ounces of cream cheese so that it's soft. Mix in 4 ounces of finely ground cashews, 2 ounces of raisins, 4 tablespoons of white wine (or lemon juice, or rose water), zest of a lemon and 1/2 cup of powdered sugar. Sprinkle more powdered sugar on top, if you like.